Ellie, a pretty little bay Quarter Horse, recently celebrated her 14th birthday. She is owned and loved by Brooke M.; they’ve been partners since Ellie was just a five-year-old. 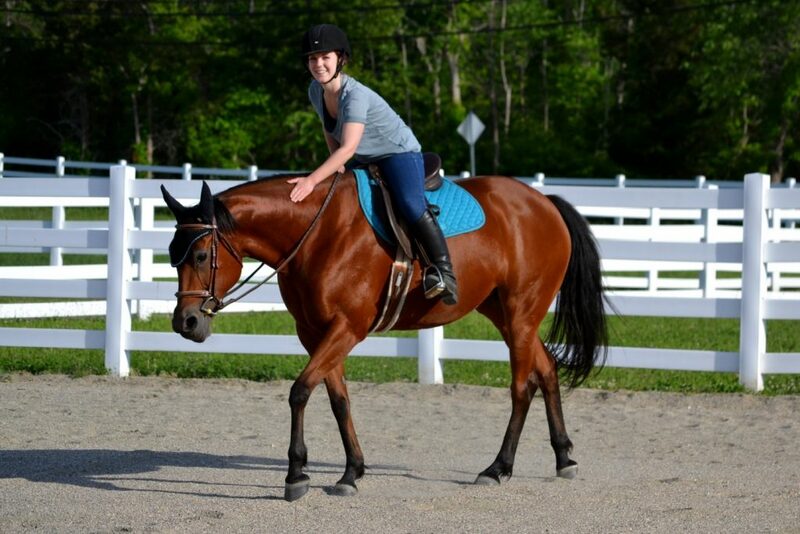 These two have been in and out of the hunter jumper show ring together, love to trail ride in the woods around their Massachusetts farm, and will jump anything in their path. 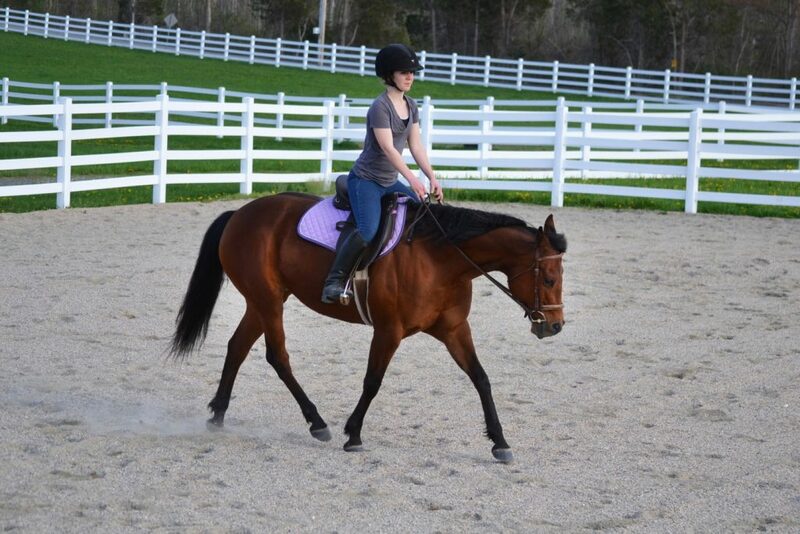 A few years ago, however, Brooke started to notice stiffness in Ellie’s back end along with occasional lameness. A vet came out to assess Ellie and prescribed a COX-2 inhibitor, a type of NSAID, recommending one tablet a day be administered with morning feed. No doubt, this helped: Ellie was moving better, happy to swap her leads on the fly and turn tight to the next jump once again. Relieved to see her mare comfortable, Brooke continued to keep Ellie on that prescribed regimen. She has always been a bit skeptical of the daily administration of an NSAID, though. “I want Ellie to be comfortable and feeling her best, but I question whether keeping her on a drug for the rest of her life is the best solution,” Brooke says. She’s right to think twice about this; long term use of NSAIDs, even COX-2 inhibitors, have routinely been linked with negative effects on gastrointestinal, kidney, and liver function. Ellie has many good years ahead of her, and Brooke would hate to put anything in jeopardy by medicating her long term. Fortunately, holistic, alternative solutions for pain relief have been gaining a lot of ground in recent years. Natural ingredients backed by science and results are offering new ways to address pain in the long term without the fear of scary side effects. Enter Bute-Less® Performance, which piqued Brooke’s interest when she saw the word curcumin. “I’d heard of the natural antioxidant having great health benefits for humans, and was curious as to what it could do for horses,” she says. Bute-Less® Performance has taken all those health benefits, including inflammation support, muscle recovery, and digestive support, and optimized them for ideal absorption in horses. The result is powerful, natural relief from the inflammation that so often comes with training and competition. The type of curcumin in Bute-Less® Performance is key, here: Longvida® SD optimized curcumin, a breakthrough formula developed by Verdue Sciences and UCLA neuroscientists. Clinical data has shown that Longvida® is at least 65 more times bioavailable than unformulated curcumin, allowing free curcumin to be most efficiently delivered and best absorbed within the body for optimal results. And those results were clear. Bute-Less® Performance was put to the test during a clinical study* at Louisiana State University School of Veterinary Medicine. Osteoarthritic horses administered Bute-Less® Performance daily over a month’s time showed improved lameness, reduced pain, and maintained stomach health. With that kind of proof, Brooke was more than just interested. “Why don’t we give it the 30-day trial too?” she wondered. So, Brooke and Ellie are making the switch to Bute-Less® Performance over the next 30 days, as they get back into spring training for a full season ahead. Brooke will be working Ellie consistently, watching closely for any changes in Ellie’s range of motion, or any signs of lameness, discomfort, stiffness or irritability. If Ellie remains sound and happy, she’ll switch permanently to Bute-Less Performance, kissing the daily tablets goodbye. It’s time to check in with our friend Ellie, who has been enjoying a daily scoop of Bute-Less® Performance Comfort & Recovery Support pellets for just over two weeks now. 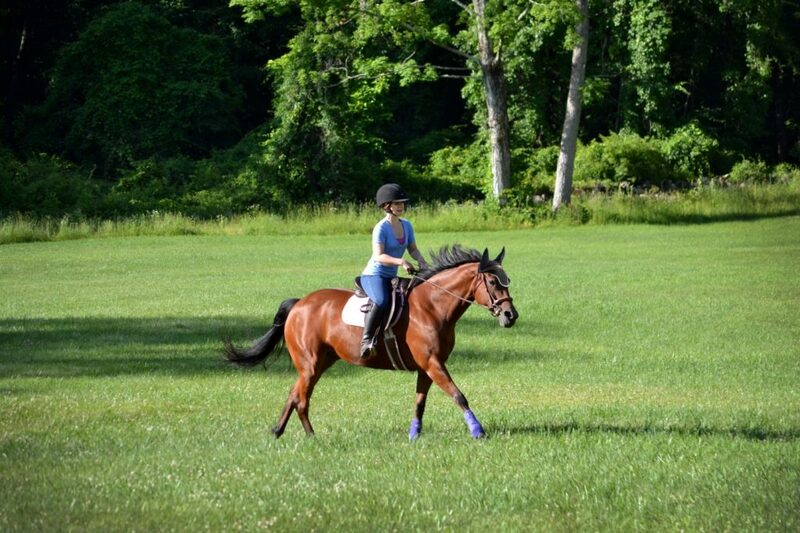 The mare’s owner, Brooke, decided to switch from a daily COX-2 inhibitor tablet to our curcumin-based supplement to see if she could relieve stiffness and soreness without depending on an NSAID. Brooke switched Ellie to Bute-Less® Performance at a crucial time of year, when the pair are back in full training after a slow winter and are focused on building up strength and stamina on the flat, over jumps, and out on the trail. It was typically during transition periods like these that Brooke would notice Ellie sometimes starting out stiff, or feeling sore if pushed harder than usual. 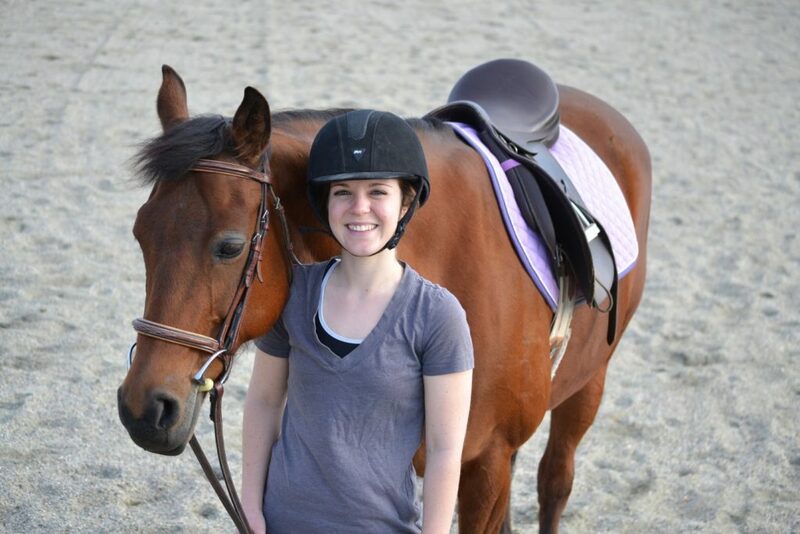 “She consistently feels happy and ready to work, moving out nicely and remaining supple and responsive,” Brooke says. “I’m even getting flying lead changes out of her, which have not always been our specialty!” She laughs. This mare is clearly feeling great – the two are a pleasure to watch at work. 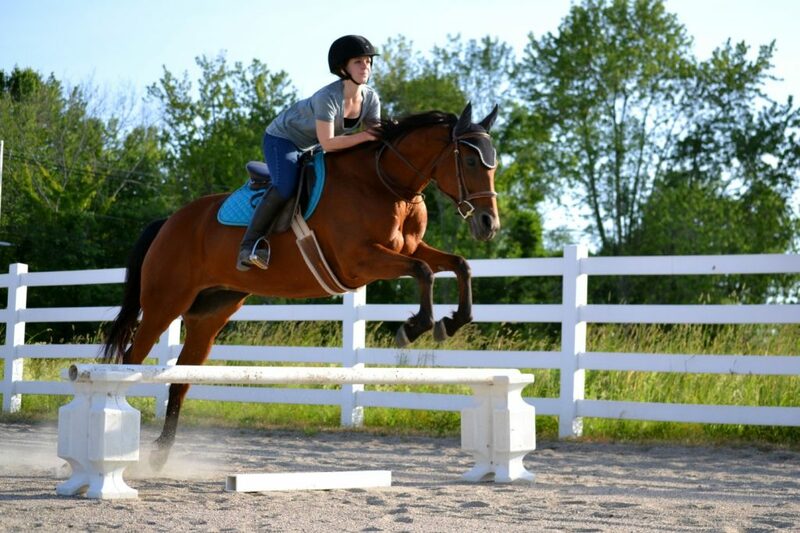 Ellie’s stride is fluid and graceful, she makes transitions with ease, and perks her ears towards the fences, bounding over them with total confidence whenever Brooke asks. It’s time for our final check in with our friend Brooke and her quarter horse mare, Ellie, who have been giving Bute-Less® Performance a try for the last 30 days! 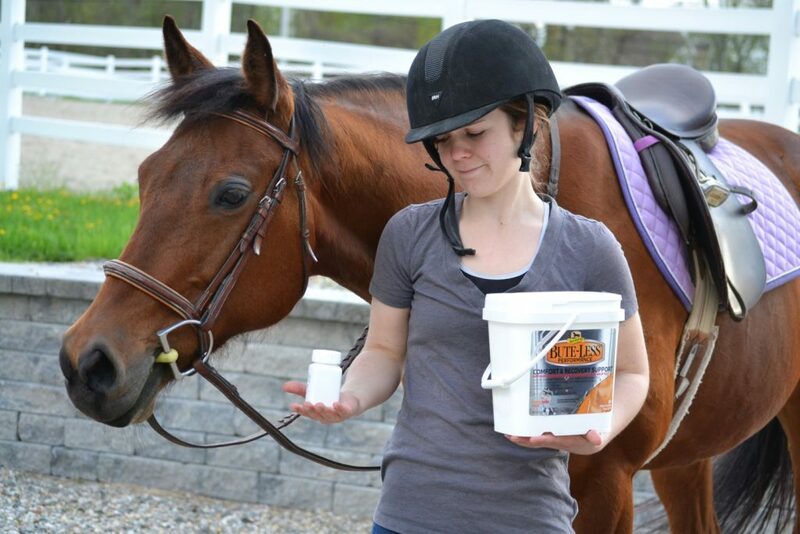 When they began the trial, Brooke was looking to transition Ellie off of her regular COX-2 inhibitor, and on to something more natural to help with the mare’s stiffness and occasional lameness. 15 days in, Brooke was impressed to see Ellie hadn’t missed a beat; she had been consistently happy to work and was moving out comfortably. 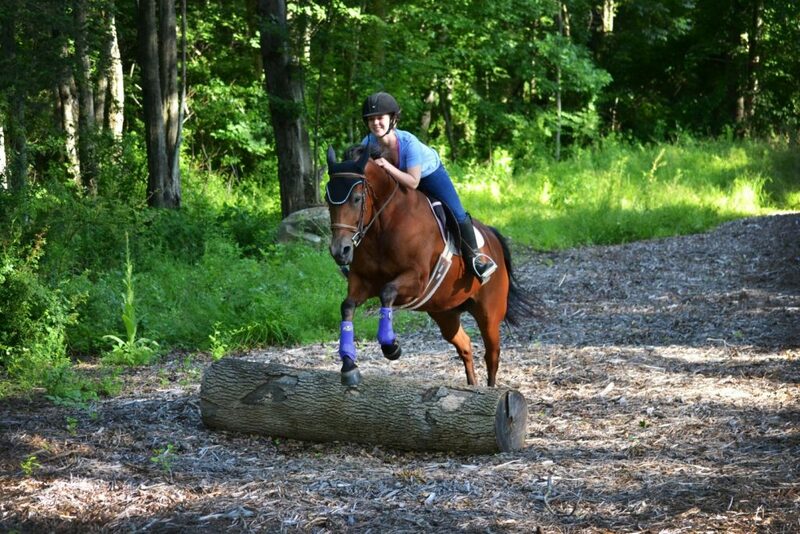 As the pair tackle steep hills, jump over logs, and canter long, grassy stretches, their confidence in each other shows. Brooke has done a great job building up Ellie’s strength and stamina, and we’re glad Bute-Less® Performance could help them reach this point. Thanks for making the switch to Bute-Less® Performance, Brooke! If you’re ready to give this clinically-proven, Ellie-approved supplement a try too, here’s a $25 rebate off your first bucket. Let us know how it goes! This entry was posted in Equine Health & Care and tagged absorbine, absorbine bute-less performance, bute-less performance, Discussions At Dover, dover saddlery, horse health, horse supplement, Natural Joint Supplements for Horses, supplement by Dover Saddlery. Bookmark the permalink.